Even though the state legislature deemed boxing, one of the original Olympic sports of ancient Greece, unsavory enough to outlaw it in 1867 (the statute remained on the books until 1923), the Sweet Science never went down for the count in Pennsylvania. In fact, the law hardly laid a glove on it. 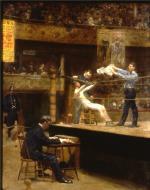 Between Rounds, by Thomas Eakins, 1898-99. After the state technically prohibited staging, watching, and wagering on "prize fights," so-called "sparring exhibitions" were perfectly legal as long as local communities approved them. When that failed, there were out-of-the-way fields, empty warehouses, and even barges on the Ohio River, just beyond the reach of Pennsylvania authorities. Pennsylvania, with its mines, mills, and continuous arrival of immigrants anxious to work in them, could hardly have provided a more welcoming environment for the sport. It had eager participants and a built-in audience. In 1883, John L. Sullivan, the last heavyweight champion of the bare-knuckled era, set off on a grand exhibition tour, offering a princely $1,000 to anyone who could last four rounds with him. One of his stops was in Lancaster; where his pugilistic display filled the generally genteel Fulton Opera House. Challenge exhibitions like Sullivan's were immensely popular, but by the end of the nineteenth century, a network had formed to advance the sport: the local athletic club. By promising to stage only clean and fair matches that adhered to rules set down in England in 1867 by the Marquis of Queensbury these clubs helped transform an outlaw activity into a legitimate sport. In the cities, larger clubs such as Pittsburgh's National Athletic Club sanctioned bouts in larger venues. In 1909, the club sponsored a pair of championship matches at Duquesne Gardens, the first featuring middleweight Stanley Ketchell, and the latter with Jack Johnson, the first African American to win the heavyweight title. Boxing inside Irene Kaufman Settlement House, Pittsburgh PA, February 1928. By then, most mill towns, steel towns, blue-collar communities, and working-class neighborhoods in the state had an athletic club with boxing at its heart. Wherever there were young Irishmen, Italians, Germans, Poles, Jews, African-Americans, Hispanics, or anyone else, willing to use their fists to earn a few extra dollars and maybe a shot at a better life, if not a title, there was a club where they could lace up the gloves. Little more, at first, than a ring, some seats, and a place to train, these clubs grew into small, local arenas where amateurs and professionals fought side by side. Whether dubbed Gardens, Auditoriums, or Ballrooms, inside they were pretty much the same. The air smelled of sweat and liniment and swirled with cigar smoke, the canvases were stained with blood, and patrons sat so close to the action they could hear the snap of every punch. Clubs served as a kind of informal farm system that fed into larger venues like the Arena, and the Alhambra in Philadelphia, Duquesne Gardens in Pittsburgh, and Madison Square Garden in New York, boxing's Mecca. On promise alone, contenders and green hopefuls filled the seats on their way up, while ex-champions, trying to eke out a few extra paydays, filled them–on fumes and reputation–on the way down. And between them, a new breed of pug emerged: the club fighter, either skilled or just tough enough to put on a good show, but never able to progress beyond club walls. Many club fighters did punch their way out of the smoke and into the spotlight. Pennsylvania's celebrated club alumni include such world champions as welterweight Fritzie Zivic; middleweights Harry Greb, George Chip, and Frank Klaus; and light heavyweight Billy Conn from Pittsburgh and its surrounds. Amazingly, between the summer of 1939 and the fall of 1941, five western Pennsylvania fighters held titles in five of the traditional eight weight classes; at no other time in boxing did one city so dominate the professional scene. Philadelphia clubs spawned their share of champions, as well, including bantamweight Jeff Chandler; middleweight Joey Giardello; light heavyweights Jack O'Brien, Battling Levinsky, Tommy Loughran, Harold Johnson, and Matthew Saad Muhammad; and heavyweight Joe Frazier. So fabled was the image of the club fighter–the pug–that the two most famous of all were actually fictional: Joe Palooka and Rocky Balboa. Long a mainstay of newspaper comic strips, Joe Palooka was modeled by Hammond Fisher, then a staff artist at the Wilkes-Barre Record, on a local "palooka" he knew from the anthracite coal region. Rocky, of course, gained movie immortality with the release of the first Rocky movie in 1976. Actor-writer Sylvester Stallone found his inspiration for the "Italian Stallion" in South Philadelphia. 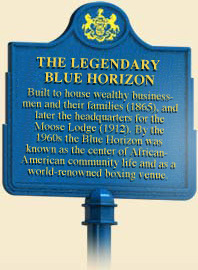 Of all the Commonwealth's great boxing clubs, the unlikeliest, considering its past, may well be Philadelphia's renowned Blue Horizon, named in 1999 by readers of The Ring magazine as "the best venue in the world to watch a fight." A gritty throwback, it came into the game relatively late, in 1961, long after boxing's widespread popularity and the vast majority of its supporting clubs had faded away. Located in North Philadelphia – "Make a left at City Hall," instructed the club's founder, Hall of Fame promoter J. Russell Peltz, "and keep going until you get scared" – the structure itself was built as a trio of Second Empire-style row houses at the end of the Civil War. In 1912, The Loyal Order of Moose bought them for a lodge, adding a ballroom and auditorium. Before Peltz transformed and renamed it, the building also saw duty as a church and social hall. In its heyday in the 1960s and 1970s, fighters fought in front of standing-room only crowds in the 1,200 seat arena, and the Blue came to epitomize the ideal of the Philadelphia fighter. More than thirty future champions, including "Joltin" Jeff Chandler, Harold Johnson, heavyweight Tim Witherspoon, and longtime middleweight titleholder Bernard "The Executioner" Hopkins, honed their skills in its ring. "Everyone knows," says Hopkins, who defended his belt a record twenty times over ten years before losing his crown on a split decision in 2005, "that when you fight a Philadelphia fighter, whether it's at the Blue Horizon or the Spectrum or wherever, you're going to see a fight. They're going to give their sweat, blood, and tears to put on a good performance. That's Philly, man. It's something in the air." That same year, Ring magazine called the Blue Horizon "the best place to watch a boxing match." With three floors of space, the Blue Horizon also hosted other events, including weddings, comedy shows, and concerts, and functioned as a community center. The Blue Horizon, however, was not to last. It closed it doors in 2010. Bill Barich, "Singin’ the Blue," Sports Illustrated (December 9, 1996): 70. William C. Kashatus, "Joe Palooka: Wilkes-Barre Boxing Legend With a National Punch," Pennsylvania Heritage 26:2 (2002): 22-29.